I'm trying to write a story and I need some forensic details about knife injuries and wounds in general. 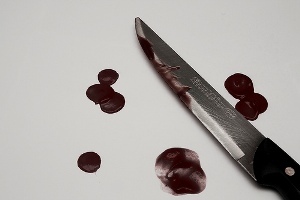 Supposing the knife is not left out into the body, what details can I obtain from the injury or wound, directly on the "crime" scene, and those that must be analysed in the lab? The proposed area of the wound is the neck. Ear to ear.